Samir Malik is currently the Executive Vice President and General Manager of Genoa Telepsychiatry, the largest outpatient telepsychaitry provider in the country. Samir came into this role through the acquisition of his company, 1DocWay, a New York City-based telepsychiatry company, which he co-founded and served as CEO. The company expands access to mental healthcare in rural America. Samir and his team have built the technology-enabled-services company from scratch, treating over 100,000 patients across the country. Prior to 1DocWay, Samir was the President of Signature Healthcare, and CEO of ZipCare Transportation, two healthcare service companies he started and led. These two endeavors have grown in the past 5 years from two employees to over 200, while improving access to healthcare in markets and populations in need of mental health access. From 2010 to 2012, Samir was the Director of Strategic Planning at CenterPointe Hospital, a 150-bed health system in St. Louis, Missouri, where he designed and built a new model for outpatient mental health programs across 3 states. 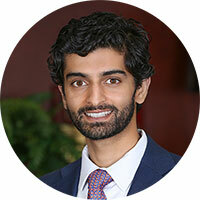 Prior to CenterPointe Hospital, Samir’s career began with McKinsey & Co as a Business Analyst, where he focused on a wide range of strategic and operational initiatives for large organizations both inside and outside healthcare. While there, Samir served as a McKinsey Hospital Institute Fellow. Samir received a Bachelor of Science in Economics from the Wharton School at the University of Pennsylvania, a Bachelor of Arts in Neuroscience from Penn with distinction, and a Master’s of Business Administration at Wharton in Healthcare Management. Samir and his wife Saara live in NYC.